3 posts in a row! I'm nearly done with the machine, still a few things to go before it works though. Here's a video I just took of the boxway linear motion. One of the main arguments for using recirculating linear ball guides instead of sliding boxways is that boxways supposedly have stick-slip, where they cannot position smoothly at a microscopic level. Looks like my boxway design, for whatever reasons, does not suffer from this. Each tick mark is 0.001 inch. It seems like the mechanical system here is nearly flawless. Backlash without the nut being preloaded is 0.0008", with preload it's less than 0.0002". Very encouraging. Be interesting to see how it goes when loaded up and again after a few tens of hours' wear but then, of course, it's pretty easy to replace the plastic slide if it gets worn, yes? Long time since the last update! Be interesting to see how it goes when loaded up and again after a few tens of hours' wear but then, of course, it's pretty easy to replace the plastic slide if it gets worn, yes? The wear pads are just sheet plastic cut into small rectangles and pressed against the boxways. They should cost a few cents each to make en masse on any laser cutter or waterjet. If I use Delrin AF (the PTFE stuff) they may cost a dollar or two each, but that's because the stuff is ridiculously overpriced at retail. Unfortunately progress slowed down a lot since the last update, a bunch of annoying things happened. I had to go through 4 backup plans for the B axis (swivel head mechanism) because the first harmonic gear didn't work. So I made several hypocycloid gears to try as plan B, none of them worked well enough. Then I made a compact worm gear system, but there wasn't enough room in the mill column to get it working that well. Then I made a bigger worm gear version that stuck out the back of the column, but it wasn't rigid enough in transmission because of all the printed plastic parts stacking up rigidity loss. Then I changed the original harmonic gear design and reprinted some stuff, it's much better now but not perfect. Mid December was the last time I had access to a machine shop, so no metal parts since then. On top of all that, I had problems with the headstock belt drive. I had to print like 10 pulleys to get it working, because the belt tensioner was causing torsional friction in the system. Now there is no tensioner, the pulleys are at an exact distance and an exact diameter to tension it. And the cheap Chinese ESC that controlled the motors on the V1 machine couldn't spin the low KV motor that the V2 uses for some reason, so I had to buy a VESC. Then the VESC blew my 24v power supply (I think) due to regenerative braking. Now I'm waiting on a new 48v 1500 watt PSU to show up. So to summarize, the last month and a half has been annoying things not working due to budget constraints, time constraints, lack of machine access ect. I've gone through 8 kg spools of black PLA on my rostock max v1 to make parts that will be machined on the production version. The machine does cut metal, both turning and milling are tested at this point. Really I'm just waiting for the big power supply to show up in a week, until then I can't do any really heavy cuts with my weak backup 24v psu that was re-purposed from the V1 prototype. Once it's here and plugged in I'll start filming the kickstarter video. Ouch, frustrating times. Good to see you sticking at it, photos look great and can't wait for an update! Single point broaching is fun, and really easy to program by hand. This finished part took just over 8 minutes. I wish my Rostock could print parts with the same mechanical accuracy and finish as what's coming off this machine. If you go back to the very first original post in this thread, this was one of my goals and reasons for making this machine. Assuming the kickstarter doesn't fail miserably, there will be hundreds of these mill turn centers in the wild by mid year, and they will give 3d printers a run for their money. Every time I see an email from <support@seemecnc.com> I get a little excited as I click the link. This is pretty much the only thread I'm subscribed to nowadays, so I know what's coming - and once again you've not disappointed with your teasing. Any updates? I joined this forum just to subscribe to this thread! Hey guys, sorry for the lack of updates. I've been posting on a few other websites instead of this one since there are really only two people interested here, these forums were very active a few years ago but have pretty much come to a halt since then. I'll cross-link to those other sites but this may be my last post here for a while since this project has diverged from Rostock Max related stuff. If anyone asks questions I'll try to respond. Hopefully the GIFs below render correctly here. They should look just like a video at full frame rate. There should be 7 of them. They are not hosted on this site, just linked to. Currently this project is in a sort of publicity-limbo. 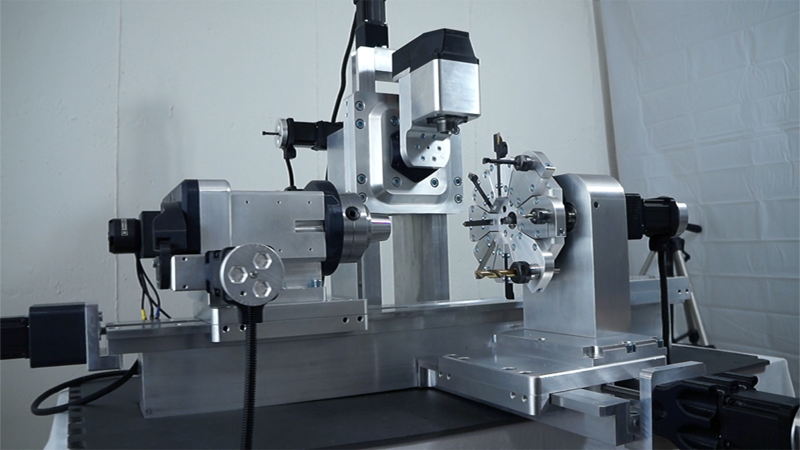 I want to launch a Kickstarter for this mill-turn center with the goal of starting a U.S based manufacturing company to make cool CNC machine/robotics/3d printing that fill in the gap between full sized industrial machines and cheap imported junk like those little T slot router kits. I think this is an under-served market with a lot of ignored potential, as there are plenty of Makers who can't get what they want right now. Kickstarter has some quirks; it rewards projects that get a lot of attention within the first few days of launch. Anything that doesn't ends up sinking to the bottom on the list and never gets any attention. It's a positive feedback loop. To get this immediate attention, I need many people actively following the project in anticipation of backing the project within the first three days of launch. Right now the problem is that forums like these (and the ones I linked to) are not driving enough traffic. I don't have loads of money for advertising or hiring a PR team. My best bet is to have a few tech journalists/article websites write about the project, then launch at peak publicity. I hate to be one of those pushy people trying to get shares/retweets/ect but it ultimately comes down to the community to spread the word. It would be much easier if I could just dump a bunch of money into it for views and followers, but I can't. So the Kickstarter will launch once there are enough people interested. Any questions? Ask away! So I saw that you went live and have hit your funding. I was slammed at work and missed on the funding window, keep us posted on progress and let us know when the general purchase will be available. This is the exact kind of machine I am looking for. So I disappear for a little bit and come back to this? WOW!!! pretty cool!! !